Using sherry instead of wine gives it a less sugary taste. Nothing better than a creamy risotto with fresh flavours. Recipes inspired from travelling around the world. Have a look at Chaos in My Kitchen for inspiration in cooking. Wash the asparagus and chop the asparagus into chunky pieces. Chop the onion and garlic finely. Grate parmesan and prepare stock. Set aside. Heat the butter in a large saucepan over medium heat. Add the onion and cook for a couple of minutes until translucent. Add the rice and cook for 2 minutes, keep stirring to not burn it. Add the asparagus and keep cooking for another 2 minutes. Add the sherry, allow the rice to absorb it. When almost absorbed add some of the vegetable stock. Add the mint leaves. Keep cooking and slowly add stock as needed. When the rice is almost done add the lemon. 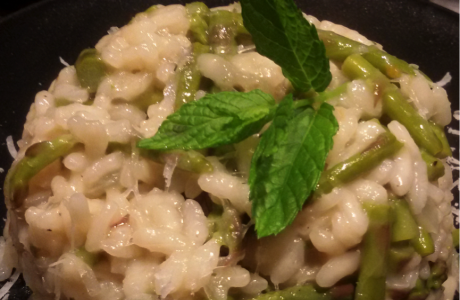 When the risotto is nice and creamy, season with salt& pepper, put it on the plate and sprinkle with the parmesan.